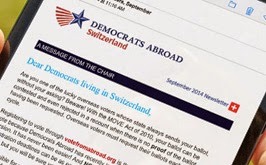 RSVP: ed@democratsabroad.org, by February 20th for dial-in instructions. Discussion and drinks to follow. Bring drink or snack to share. March 15 - DA Milan will examine the "i's" of Obama's foreign policy with guest speaker John Ikenberry. Volunteers needed to staff our booth. Contact vice-chair@democrats.ch for more info or to sign up for a 1-2 hour shift.